Weird Things » Blog Archive » Bird Flu Goes Viral in Lab Ferrets! Bird Flu Goes Viral in Lab Ferrets! Virologists and epidemiologists sure can be a fun bunch. Put enough money behind one of their projects and who knows what you’ll end up with. In this case we may end up with the end of the human race. Remember the bird flu scare? Total Year 2000-style panic. Many people just took it as another sign that those silly Mayans weren’t so silly and 2012 was the last time they’d have to buy a calendar from one of those kiosks in the mall. After an article in the L.A Times, that panic could start to rear its ugly head if current research results on the H5N1 virus mentioned in the story begin making rotation on televised news sources. Scientists have been playing with the bird flu virus in order to see if it would ever mutate enough to become a pandemic among humans spreading merely through someone sneezing on someone else. And guess what? It could. Since 2003 there have been 606 confirmed cases of H5N1 in humans…almost 60% of those proved fatal. Fatalities among birds, where the virus gets its ‘bird flu’ monicker, have been in the millions. Scientists want to get a lead on the pathogen to see what evolutionary process it would have to take to become a global pandemic amongst humans. They have an answer and it’s not pretty. Using ferrets, Dutch researchers led by virologist Ron Fouchier, have developed a strain of the virus that is transmitted through droplets in sneezes. Passing ten times between infected ferrets and mutating five times in the process, H5N1 became airborne and a very real threat to all of us. 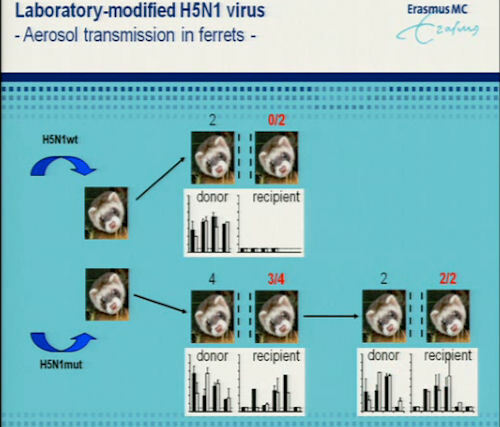 After injecting one ferret with H5N1 via droplets to their nose, scientists would let the virus mutate inside the ferret’s body. 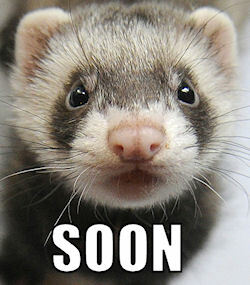 Once the virus mutated, researchers would then infect another ferret with the mustation. Ten ferrets and five mutations later? Lots of ‘uh ohs’ and nervous, unspoken glances at the other scientists in the room. 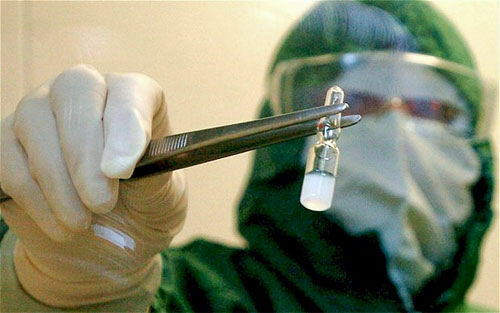 As the government continues to provide funding for studies like this in ongoing biological weapons research, scientists, researchers and world leaders are trying to put safeguards in place and determine just how far developing mankind-destroying viruses should go. The public, because we’ve seen the movies, are worried that scientists may create something that would wipe us all out either because they felt like being a jerk that day, want to swim in a pile of cash like Scrooge McDuck or are making up for all those times people picked on them as a child and would like to pay everyone back for that. What most people are concerned about is when controversial papers like this are published for the world to see. All we need is one of those scientists with the back-stories mentioned above or a crazy person with enough tenacity and hatred for all of us to peruse a detailed document like the paper for this study to wake up on the wrong side of bed one day. Brakes had been applied to publishing this research. After six months of red-tape? That paper is about to go public. The Scientific Responsibility, Human Rights and Law Program at the American Assn. for the Advancement of Science (which publishes Science where the paper will appear) want the paper to see publication so that work can continue on the H5N1 virus. Both the Dutch and US government are seeking to add addtional guidelines concerning publishing research like this in order to prevent individuals from having complete access to the process of creating something like the airborne H5N1 mutation so it doesn’t end up at some local elementary science because some super-nerdy ‘pageant parents’ wanted little Billy to get first place at any price. Director of the Scientific Responsibility, Human Rights and Law Program at the American Assn. for the Advancement of Science (seriously…have a title), Mark Frankel, stated that the beneifit of studying H5N1 “far outweighs” any potential danger. “There’s a risk in everything in life”, he said. To which many of us would probably think that too. Especially when we decide to manufacture deadly-to-mankind, airborne viruses. I’m running to the mall…anyone else want me to pick them up one of those Mayan calendars? Something to point out that hasn’t been covered well in the news on this research (I happen to be a geek who listens to virology podcasts that have covered this topic in depth) is that while the virus mutated to passed ferret to ferret it also happened to not kill any of the ferrets who were infected with the transmissible strain. This means the virus actually because less deadly as well as more virulent which isn’t surprising, that’s often how viruses mutate. Also, ferrets aren’t people, this strain transmits in ferrets but probably wouldn’t transmit in people. In other words: lots of hype, not much danger.